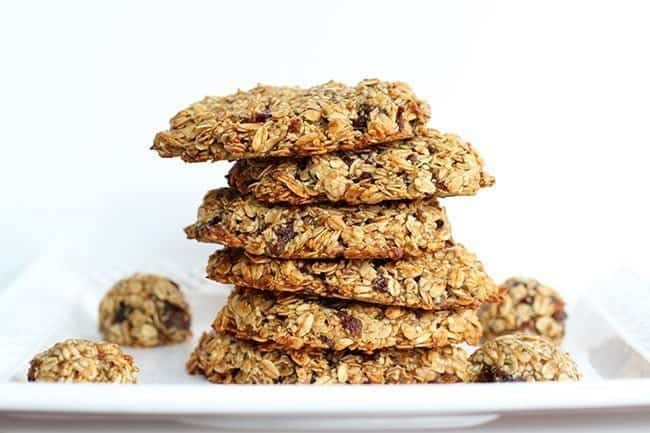 Cookies for breakfast are a thing and my Healthy Banana Date Oatmeal Breakfast Cookies are a fantastic start to your day! As much as I love a crazy decadent breakfast like my Strawberry Nutella French Toast Rolls, that’s just not how you can eat all the time. My breakfasts are so boring during the week you would snooze. Two eggs, either boiled or scrambled with cheese if I am feeling decadent and usually a bowl of watermelon. I eat watermelon almost every single day. It’s my thing. I love it. When I am out of watermelon, it’s usually a banana or grapes and with my usual cup of tea of course. Pack the dough tightly into a large ice cream or cookie scoop. Place on a parchment lined baking sheet then press down to thin it out. You can fit 3-4 per cookie sheet. Bake in the oven for 25-28 minutes until the bottoms are browned. 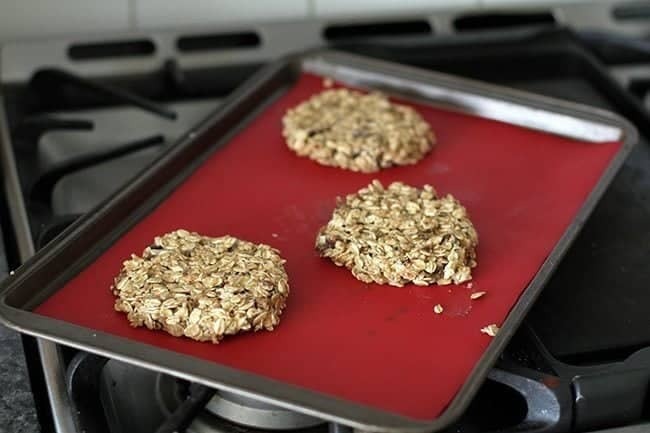 Remove and let cool on the cookie sheets completely. Let the cookies sit on the counter for a few hours to firm up. I’m just not an early morning eater, which must be why I love weekend brunch so darn much. I’ve usually slept in and not only that, I’m fully awake to eat by the time I prep anything. My children however, eat a large and varied breakfast. Eggs, toast, bagels, cereal, you name it, they eat it. So these breakfast cookies are definitely for them. I actually had a ton of bananas to use up and I was tired of making banana bread. I then thought of cookies, but wanted to make something healthier. These breakfast cookies basically are everything I had on hand thrown in to make a cookie. The secret to these cookies not falling apart is leaving them to firm up on the counter, in the air and not in a container. They wanted to fall apart as soon as I took them out of the oven, then I wisely left them alone. They don’t dry out as much as firm up and then I had no problems with them at all. These cookies are big and are meant to be a FULL breakfast on the go. Three cookies per sheet, folks. These are meant to be a large breakfast cookie, not a snack. This is an on the run, have one quickly in the car with a banana type of cookie. The full meal deal. They are sweet but if you are looking for a junky, sugar tasting cookie, these are not the cookies you are looking for. 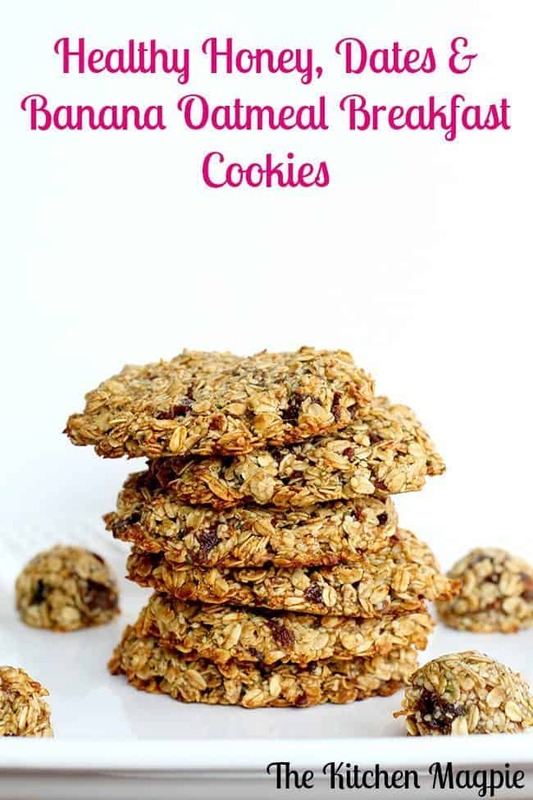 These taste like a breakfast cookie, closer to a homemade granola bar. Happy baking everyone! I hope that you enjoy them! 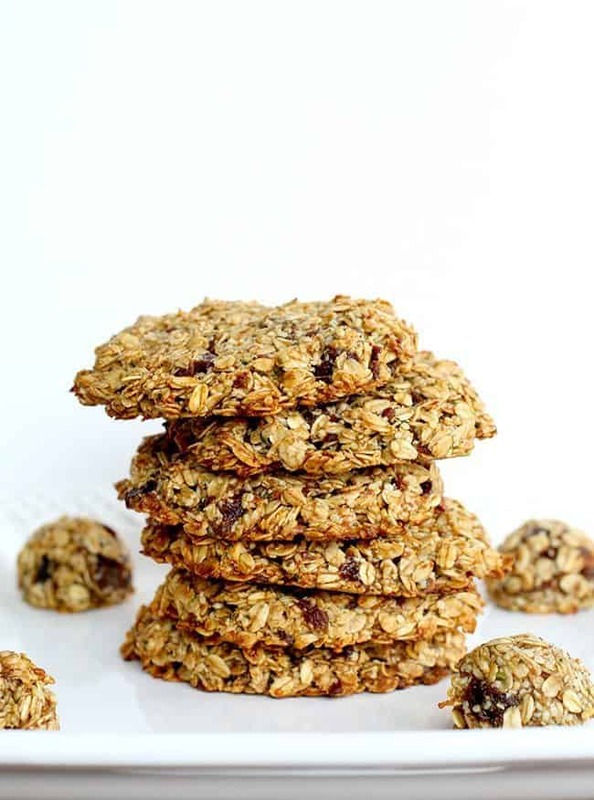 Healthy and hearty Banana Date Oatmeal Breakfast Cookies. Easy and delicious! Im going to make these! ! Im going to make thèse! ! I’m a breakfast snacker, usually an Avocado and a Banana! These are super yummy! My very picky 9 year old ate almost all of them! “Our hemp hearts are always zero net carb, high in protein, nutrient dense and optimally balanced, boasting a 3:1 ratio of Omega 6 to Omega 3 fatty acids, antioxidants and other vitamins and mineral, including iron. Flavor Profile: Subtle earthy profile with a pleasant “nutty” taste and soft chewy texture. I don’t want these all eaten in one day…is there a good way to store them for a few days? Or can I put them in a sandwich bag the night before to be grabbed on the way out the door? Can you freeze them? Tastiest cookies I’ve made. I have got into a bad habit of wanting biscuits with a cup of tea so had to find a healthy alternative to the shop bought varieties. I added a mix of sunflower/pumpkin/sesame seeds, and olive oil instead of butter…..so easy to make and a great breakfast-on-the-go or healthy snack. Thank you! Exactly! I’m a brunch or lunch girl. I usually can’t eat until hours after I’m awake. Karlynn, I *need* to make these… no hemp hearts on hand… any substitution? Nut flour maybe? Or nut? I love these! I am always afraid that “healthy” means “tastes like cardboard”, but these are really good. I’m on a mission to have some grab-and-go breakfasts on hand in order to reduce our morning trips to the drive-thru for a breakfast sandwich and these cookies are high on the list of yummy breakfasts to keep on hand!